Every blogger knows skincare is one of those products that takes time to fully test and review, but for me, I need just as much time with hair products. I've never been one to use many products and honestly, get a bit overwhelmed when it comes to mixing and matching hair products- I tend to fear I'll use the wrong products and end up an oily, stringy mess. With that said, I've ended up with quite a few hair products finally ready for review. 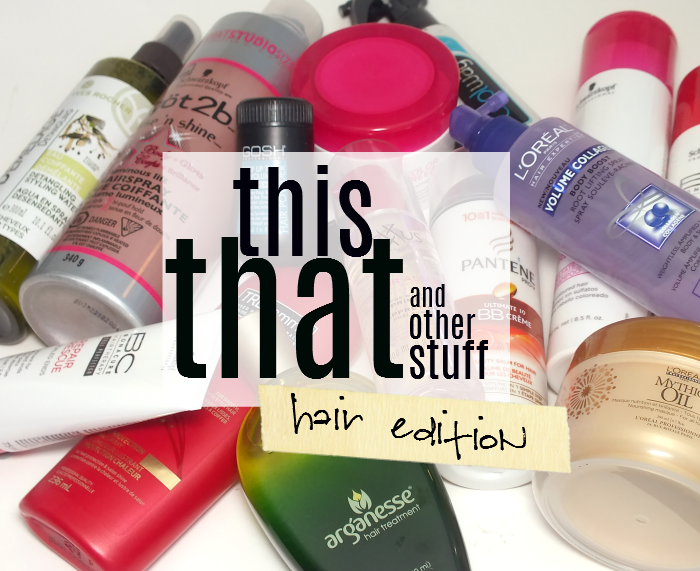 Quite a few seems to have turned into quite a lot, so grab a snack and settle in for a full on hair care extravaganza This, That, & Other Stuff style! While I wouldn't call myself someone who is devoted to any particular brand (for anything) but Schwarzkopf has become my most used/love brand for hair products. Partly because my hairdresser uses the brand (and gives me the supply store price when I buy from her, which never hurts) but the products never disappoint. They've recently revamped/relaunched their BC Hair Therapy range into six options to provide something for every hair type. I've been using the Schwarzkopf BC Hair Therapy Colour Freeze Sulfate-Free Shampoo (formerly called Colour Save) for some time and love it. It's super gentle on colour- even semi-permanents. I do find I have to use more than other shampoos as it just barley lathers and can be hard to spread out. It also pairs very well with the Schwarzkopf BC Hair Therapy Colour Freeze Treatment which not only conditions, but also nourishes and brightens colour. If you're like me and tend to use bleach on your hair- I was so born with the wrong hair colour- then the Repair Rescue range is made for you. It's designed to repair/restore the protective layer of hair which helps make hair less prone to breakage and further damage. 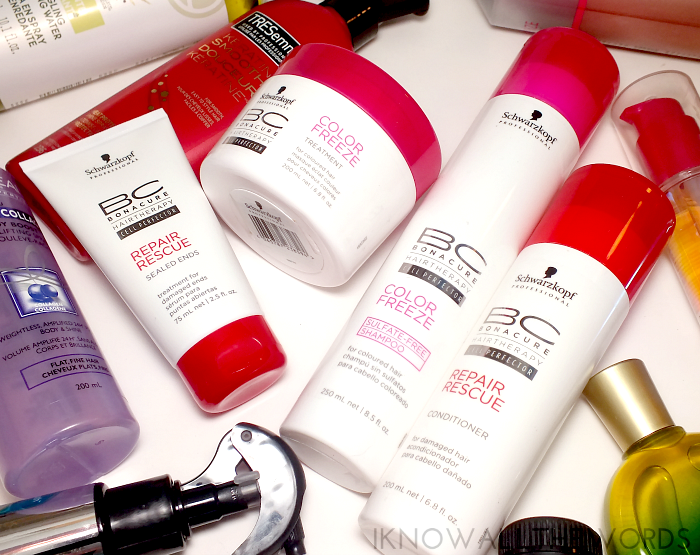 The Schwarzkopf BC Hair Therapy Repair Rescue Conditioner gives you the benefits of a restorative hair mask, but in the form of a basic conditioner that only needs two minutes to work it's magic, while the Schwarzkopf BC Hair Therapy Repair Rescue Sealed End Treatment is a cream-serum designed to seal ends and protect hair from developing split ends caused by damage. While my hair is shorter now, one of my long hair must haves is still useful- Yves Rocher Detangling Sytling Water. It's essential if you have tangle prone hair. I swear you can just give my hair a little side-eyed stare and it will tangle. This works amazingly well on damp or dry hair to loosen up knots. I find my hair especially prone to tangling after it's been bleached- when it's also more prone to breakage- and this allows my to use less force when brushing. It's also great because it's so light in hair and doesn't leave any kind of film or build up. Another one of my long hair must haves is a good conditioning mask. One I've been very pleased with is L'Oreal Professional Mythic Oil Masque which is creamy and rich feeling, but also leaves hair incredibly soft and silky without being heavy. It is incredible on dry, damaged ends and isn't as pricey as other conditioning masks. I like to apply this after a shower and let it sit a little longer- 20 minutes or more- to get the most out of it before rinsing. Oh, and it smells pretty damn good too! 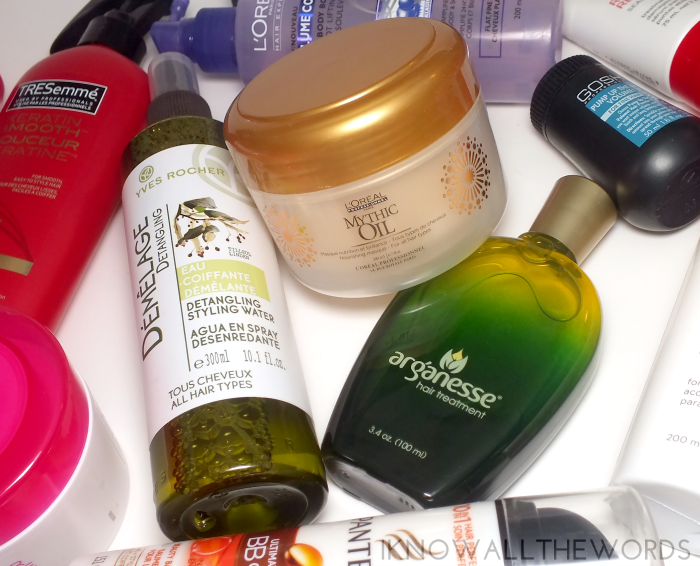 Continuing on with they hydration theme is Arganesse Hair Treatment. Arganesse is an argan oil based treatment, but it's been formulated to leave less oiliness on hair while still providing all the benefits of argan. I was a bit surprised that the product has a thicker, syrupy texture, but it is really nice in hair. It gives hair incredible softness and manageability, and as claimed, doesn't leave it oily- even if you use a little bit too much. The main reason I don't always use oils in my hair is the fact that they can leave it oily, or make it oily faster at any rate, so I love that I can go longer before needing a wash with Arganesse. The downside is the price, it's definitely on the pricey side. In the 'not worth the time' category is Coolway True Smooth Spray. In theory, it's supposed to reduce blow dry time by half (what?!) while strengthening hair, reducing frizz and leaving hair as smooth and shiny as a flat iron would. Sounds amazing right? I'm not the most skilled with a blow drier (mainly because I don't use it much), but in the name of testing this spent a week with my blow drier to get acquainted with how my long my hair takes to dry and how it looks without Coolway. I then spent a week using Coolway. While it has a really nice macadamia cookie type scent (so good!) it really didn't do much of anything in my hair. Blow dry time was about the same and my hair looked about the same too. Okay, exactly the same. So, for me, it's a waste of time and money as it's fairly pricey. In the 'I use it, but does it really do anything...?' category is TreSemme Keratin Smooth Heat Protection Shine Spray. I use it because I should, you know, protect my hair from heat but can you ever truly know if your heat protection spray is working? That said, I do like this one as it's undetectable on hair (no worrying about a residue if you over do it). I wouldn't say it makes hair all that much shinier however. Can hair ever have too much volume? Maybe it can, but I like to get as volume into my hair as possible. L'Oreal Hair Expertise Volume Collagen Body Boost Root Lifting Spray is one of the easiest ways to add some oomph to fine hair. A few spritzes on damp hair gives hair that extra something. It doesn't give a ton of volume visibly, but I do feel that my hair is thicker/fuller feeling. This is one of the few hair products I use all the time, which says a lot. Since volume is king, I also like to use Gosh Pump Up the Volume Hair Powder. It's a light powder that gives hair some texture and a soft-matte finish plus a hole lot of volume. I love that it is so easy to use- I sprinkle it right at the root for the most ooomph- but still gives a lot of volume and lasts well. For mega volume, a tiny bit of backcombing + this powder does the trick in seconds. When hair does start to fall, a little finger comb and fluff brings it right back up. I love it! Plus, it doesn't leave hair with an odd, tacky texture like other volume boosting powders I've used in the past have. Okay, getting down to the last three products- still awake? 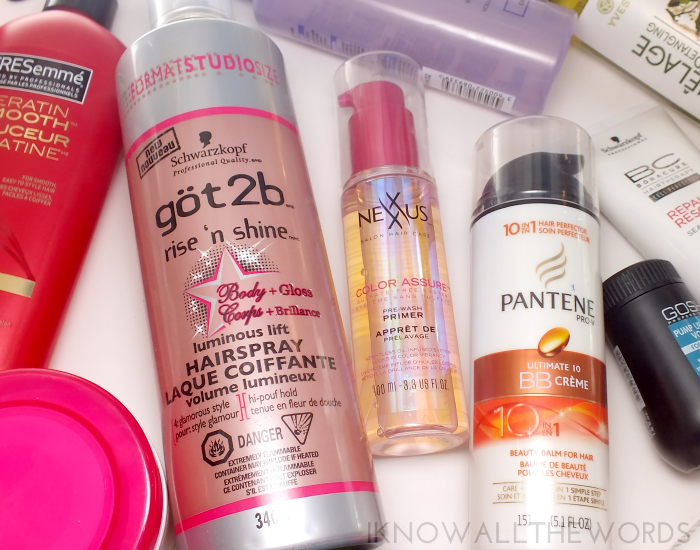 Once I've got my volume on, I reach for Got 2B Rise n' Shine Luminous Lift Hairspray. I don't know that I've ever really loved a hairspray, but oh, boy, do I ever love this one! The main lust factor, for me, is that it's so light. You can go spray crazy and get great hold but it doesn't get stiff, tacky or, well, 'ewy' all. It holds volume really well is truly a great hairspray. Love it and I love how massive the can is- although I'm almost due for a replacement. Leaving volume town, we're onto colour. If you're going to colour your hair, you probably want it to last, yeah? Nexxus Colour Assure Pre-Wash Primer does just that. I first saw an ad for it in a magazine and I was instantly intrigued. It's a weightless oil infused product that works to shield hair from water when you wash it- when water stays out, colour stays in. It's a simple concept really, but works quite well as I find I have much less colour bleed when I use this before washing my hair. So, we've been through a lot of products, a lot of various functions, but one that claims it can do almost all of them is Pantene Pro-V Ultimate 10 Beauty Balm for Hair. I know, the whole 'alphabet cream' thing has been overdone, but I was still really curious about this, as I don't tend to use a lot of product and a one-and-done product just seemed too perfect. While I really don't think this is able to do the ten functions Pantene claims it can- repair for rough hair, strength against damage, silky softness, brilliant shine, smoothing, moisture, frizz control, gentle cleaning, manageability, and detangling. Umm, does that list not seem a little bit redundant to you? Anyhow, it does leave hair a little smoother, softer, less prone to frizz and that little bit more manageable. It's a great product for those like me, who want something, but aren't really sure what to use or want something no fuss. I think that's enough hair care talk to last me for quite some time... Tried any of these products? 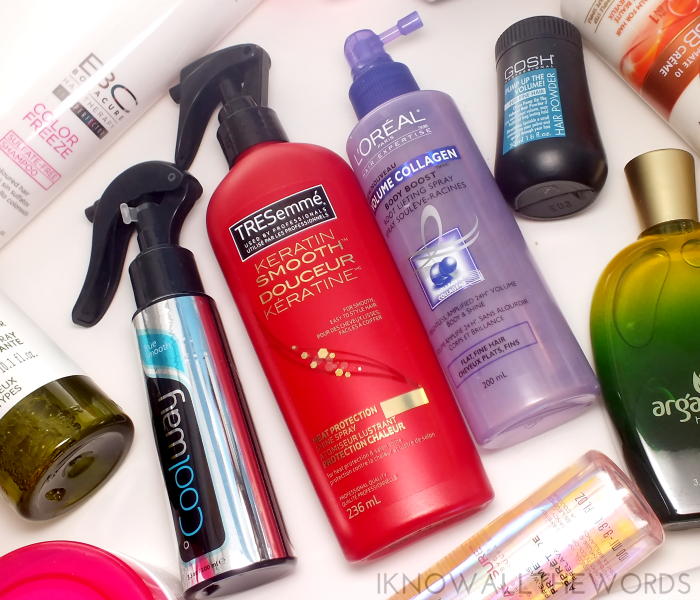 What are your hair products?